Adelaide Food Central has visited Lord of the Fries a few times since its Adelaide Grand Opening in February 2017, and tucked into their ethically sourced, vegan/vegetarian delights. The release of a couple of new menu items had us eagerly headed back to Hindley Street to check them out. First up – the 100% vegan Chick’n Drumsticks. 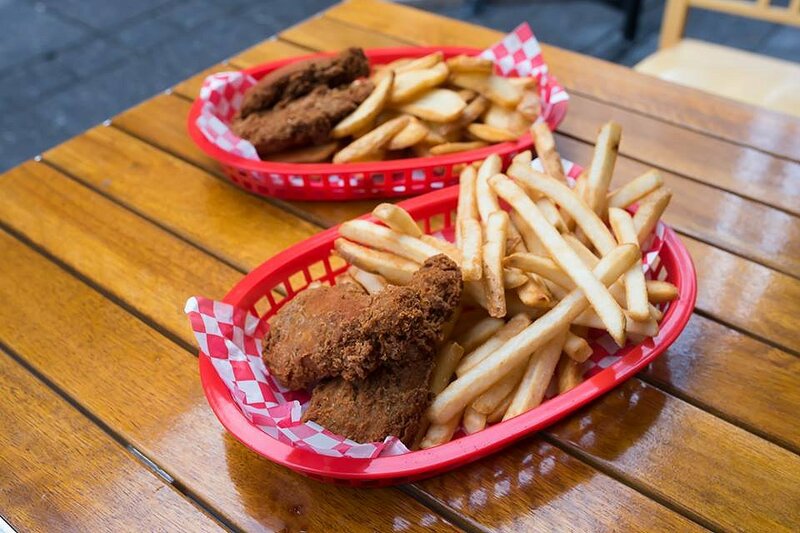 They certainly look like chicken drumsticks, drumstick shaped with a thick, golden crust that is as crunchy (actually crunchier) than any traditional fried chicken. Made from a mix of textured soy protein, soy bean, vegetarian seasonings and a few other ingredients, the texture of the “chicken” is surprisingly real. I chose to dip mine into the Indian dipping sauce, the slightly sweet, creamy mango chutney bursts with Indian spices, particularly curry and paired deliciously with both the chicken drumsticks and chips. Also pairing well was the Vietnamese dipping sauce, a chilli mayo that packs a delightful hit of chilli and spice. We’ve seen a little rise in popular Canadian dish Poutine of late. Considering the popularity of the AB in Adelaide it’s only natural we want to explore other options of layering toppings on chips. Lord of the Fries has set themselves the challenge to come up with a Pimped Poutine that fits with their food philosophy of Vegetarian, Kosher and Halal; and they’ve done a solid job of it. There is a gooey gravy that has a satisfying ‘meatiness’ to it, melted shavings of cheese, drizzled spicy sriracha sauce and cubes of crunchy white onion. 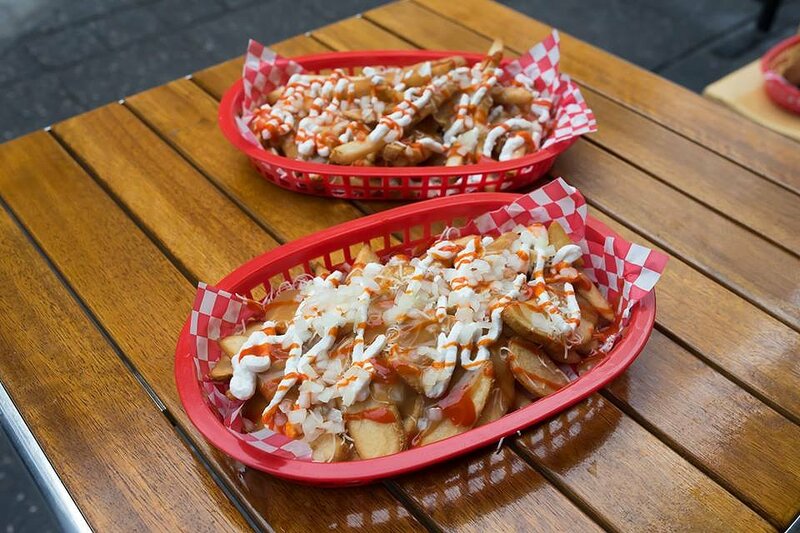 We tried the pimped poutine with both classic and chunky fries and found both to be tantalising and delicious. Famed for their fries that are locally sourced and cooked with their skins, in a quality cottonseed sunflower oil blend, our visit to Lord of the Fries yet again impressed with their chips. As a dedicated carnivore I very much enjoyed the poutine and its layered toppings and as I crunched my way through their chicken drumsticks I marvelled at how realistic they were. A fine addition to the menu of burgers, hotdogs and of course fries.